In December 2018 I took my first Costa Cruise onboard the Costa Luminosa. 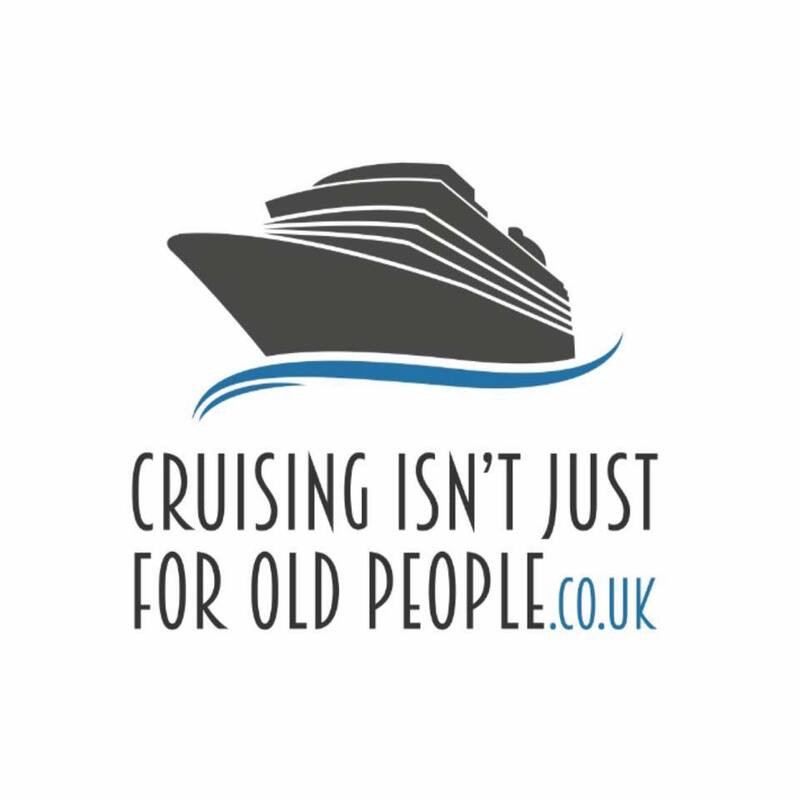 I’d always seen bargain Costa Cruises popping into my inbox and this time I decided to take the plunge. We booked a last minute deal two weeks before the cruise and set off for Venice. The cruise would take us around Italy and the Greek Islands. I have been on three MSC cruises to date. 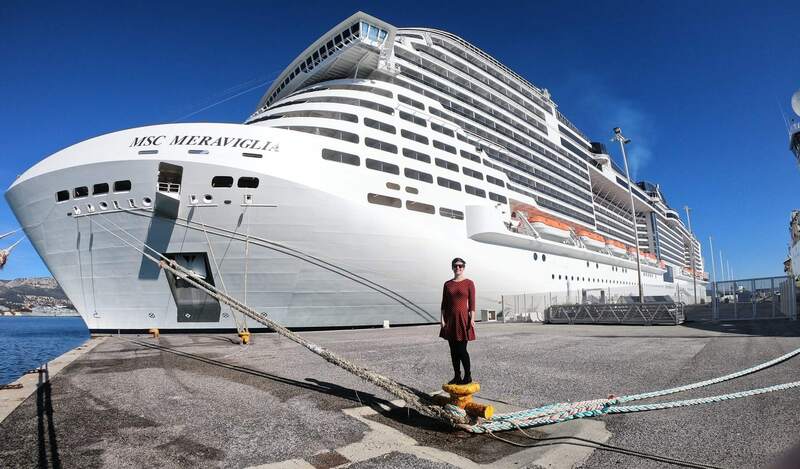 My first was in 2011 onboard the MSC Opera and have cruised on the MSC Meraviglia twice. I will be using these cruises as a basis for my comparison within this post. I’ve been on 8 other cruise lines so will also be explaining how Costa/MSC compare to American/British lines. The main difference in dining between MSC and Costa is the number of courses offered/format of the dining experience. Both cruise lines offer similar food focusing on Mediterranean cuisine (think pizza, pasta etc). They also both have speciality restaurants which cost extra. 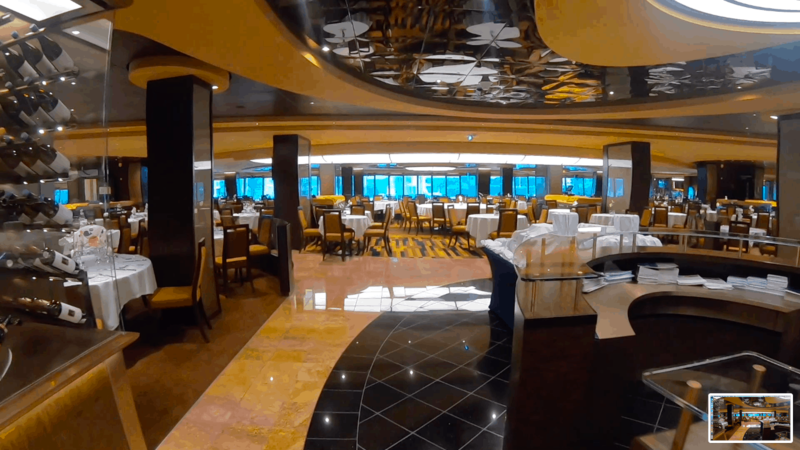 Most guests cruising with MSC have fixed dining. A more flexible option is available to guests who have paid more for an ‘Aurea’ category of cabin but in general, dining is fixed. Dinner comprises of a starter, main and dessert. There is a late and early seating and we could be in and out of dinner within around an hour. This is pretty standard on American/British cruise lines too. All dining on Costa is fixed dining. There are a number of courses and guests seem to pick and chose from whatever courses they want at the time. We were table sharing with 4 other English speaking guests and dinner always took at least 2 hours, sometimes 2.5-3. We usually skipped a number of the courses but because we were table sharing we had to wait for everybody else to finish. If you are from the UK and book an MSC cruise you’ll receive free tea/coffee and bottled water with main meals. 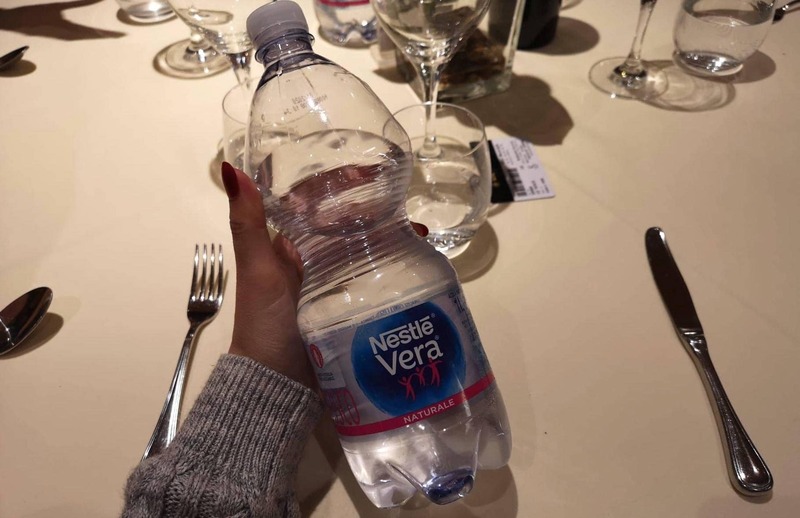 The bottles of water are still counted on your account and you have to sign for them at the end of the meal. It is always nice to sign for something with a £0 balance though! On Costa, there is no free water with meals. Considering how cheap Costa cruises are I don’t think this is a big deal but it is something to bear in mind when budgeting. We bought a water package which made it slightly cheaper per bottle. It is always really important to stay hydrated when cruising so this isn’t something to cut back on. There is water available all of the time in the buffet (when the buffet is open). On American/British lines tap water is always free in the main restaurants. On all cruise lines and ships, there are designated smoking areas. 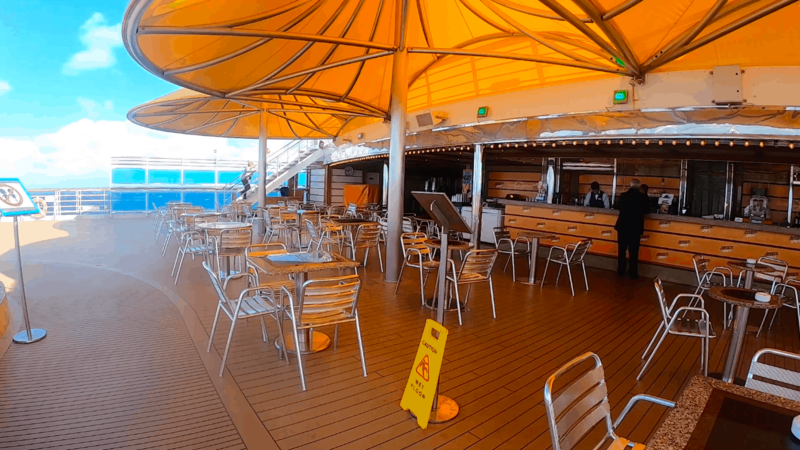 Some cruise lines have smoking areas on the top deck/promenade deck and all have smoking areas inside. The smoking area may be a special bar dedicated to smoking or a section of the casino/a bar. On MSC ships smoking isn’t allowed in cabins or on balconies. MSC have designated smoking areas on the deck where smokers will find ashtrays. They also have some bars/lounges where you can smoke but as far as I can remember they don’t have an entire lounge/bar dedicated to smoking. The same rules go to vaping. I don’t smoke and I’ve never really noticed anybody smoking on an MSC ship. 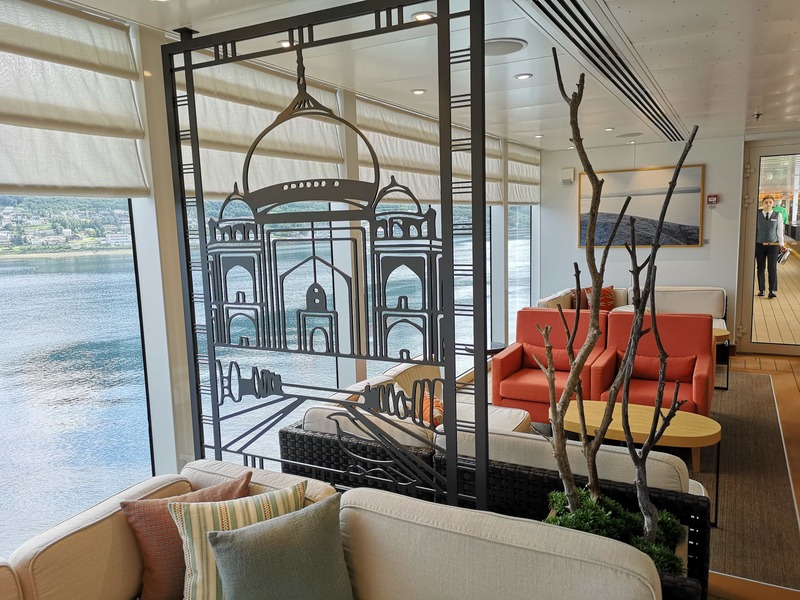 On Costa Cruises, guests can smoke on their balconies and they usually have a designated cigar lounge where guests can smoke. Electronic cigarettes can be used in the cabins! There also seemed to be a lot more smoking points around the ship on the top decks. The smoking really didn’t bother me at all but it definitely was more noticeable than on other cruise lines that I’ve been on in the past. On MSC the buffet was almost always open. On newer bigger ships like the Meraviglia often one side of the restaurant will close when they transition from breakfast to lunch or lunch to dinner. This means that the buffet rarely closes completely. The buffet on MSC ships are open 20 hours a day!!! I don’t remember the exact times that the buffet was open on the Costa Luminosa but what I do remember is that the buffet closed between breakfast and lunch completely. On one day breakfast finished at 10 am (I was still asleep at this point) and it didn’t open until lunch at 12 pm. Not a problem if you know this is going to happen and can maybe grab some snacks from the buffet the night before. I just didn’t expect there to be food free time on a cruise! The buffet also closed completely at 8.30pm. MSC ships are very glamorous, they’re all about sparkles and have very clean lines and a modern look. The MSC style is very distinctive and no other lines really have ships like it. I would describe the style as Italian elegance. When I first stepped onboard the Costa Luminosa I was completely lost for words. I’d never seen anything quite like it before. 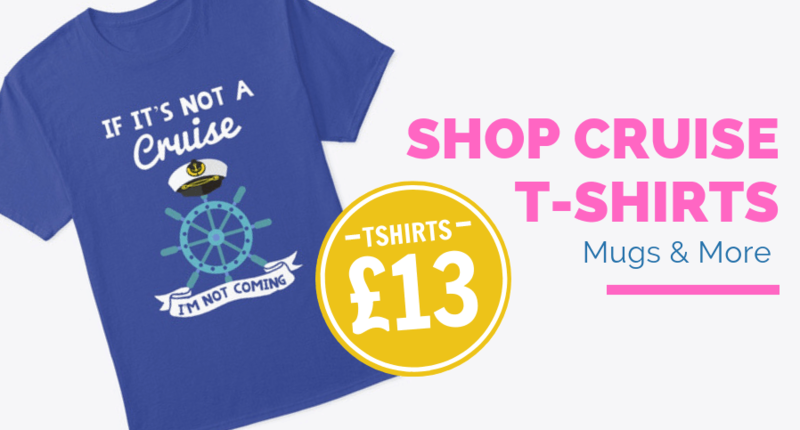 The ships are SO colourful and so fun, they’re full of life and there are quirky design pieces everywhere. I particularly liked the statue of a big naked lady in the atrium. 6 – Pizza & Ice Cream! Most cruise lines will have Pizza and Ice Cream on their menu’s. 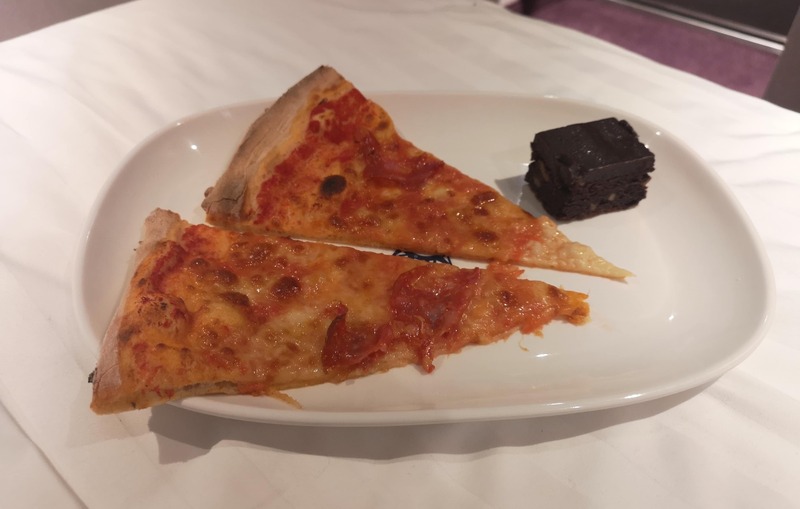 This isn’t anything particularly special but because MSC and Costa are Italian cruise lines I had slightly higher expectations on the Pizza and Ice Cream. There is access to Pizza on MSC ships at almost all times of the day. 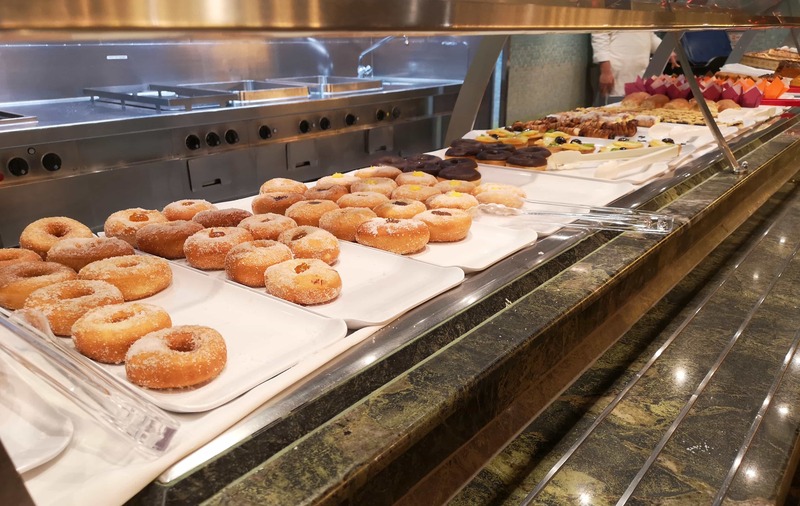 Onboard the MSC Meraviglia there is access to pizza for something like 20 hours a day! Amazing. It’s also possible to get Ice Cream in the main dining room any day. We often got late night pizza and took it back to our room. I can’t eat dairy but they also had cheeseless pizza! On most cruise lines your cabin is made up and made down each day by your room steward. Your room will be tidied, your towels and bedding changed and things like your ice bucket replaced. Your room steward will also bring you the daily schedule each evening and generally be around to help if you need anything. Like most American/British lines your room is cleaned twice a day on MSC Cruises. The room is made up in the morning (bed made etc) and made down in the evening. I usually end up getting into the bed in the afternoon for a nap and I do feel a little bad about this considering they’ve just tidied it for me. An afternoon nap is an important part of a cruise for me! On Costa Cruises, your room is only cleaned once a day. Really this is all that is needed and it’s perfectly adequate. On our first day, we were given a piece of paper to fill out to let the cabin steward know if we wanted the cleaning in the morning or the afternoon. We went for the afternoon so that we didn’t have to be woken up by housekeeping. It was nice to not have to remember to put on ‘do not disturb’ when I wanted a lay in. The above differences are really small parts of the cruise experience. 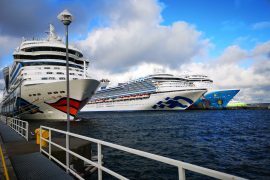 In general, the cruise lines are pretty similar and I’m sure that if you like cruising on one you’d like cruising on the other. It is important to remember how cheap MSC and Costa cruises can be. The price that I paid for the Costa Luminosa and MSC Meraviglia cruise were both under £50 per night. For that price, I find it very difficult to complain! Passengers board at multiple ports during the cruise, this is unlike most American/British lines where there is a start and end point to each cruise. Many languages are spoken onboard. Entertainment and general announcements are done in multiple languages. The food is primarily Italian although other types of food are available. I would describe MSC as an Italian cruise line but designed for people other than just Italians. There are usually a lot of people onboard who speak English and I haven’t ever felt that language was a problem. On the Costa Cruise we were definitely more in the minority by being English speaking, that said it wasn’t a problem at all and I had a great time on both cruises. I hope that this post has given you a little insight into the two cruise lines. 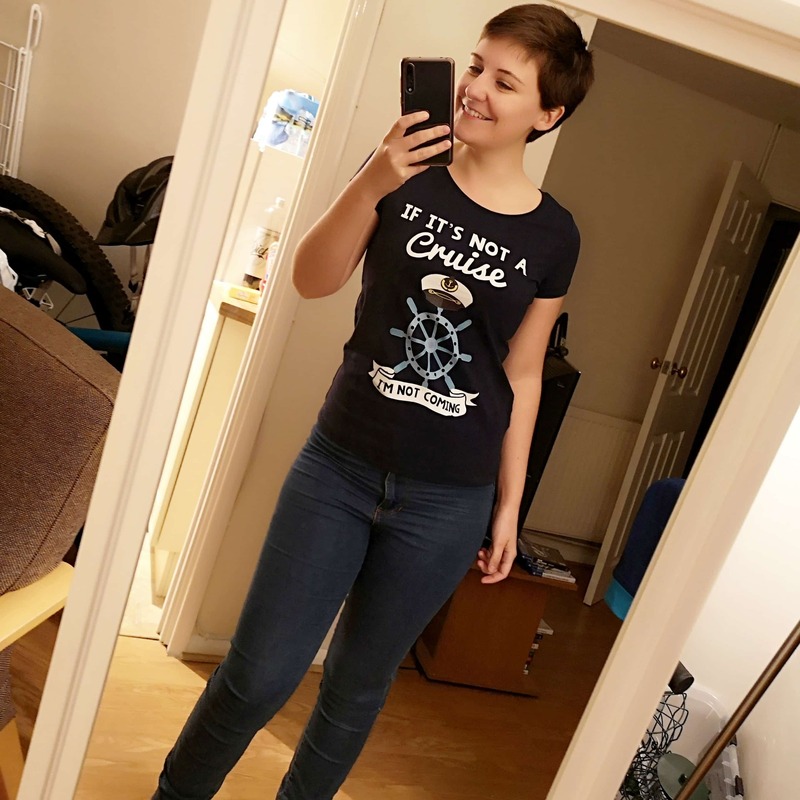 I have lots of content about both here on this site and on my YouTube channel, if you haven’t subscribed please consider doing so: Emma Cruises. 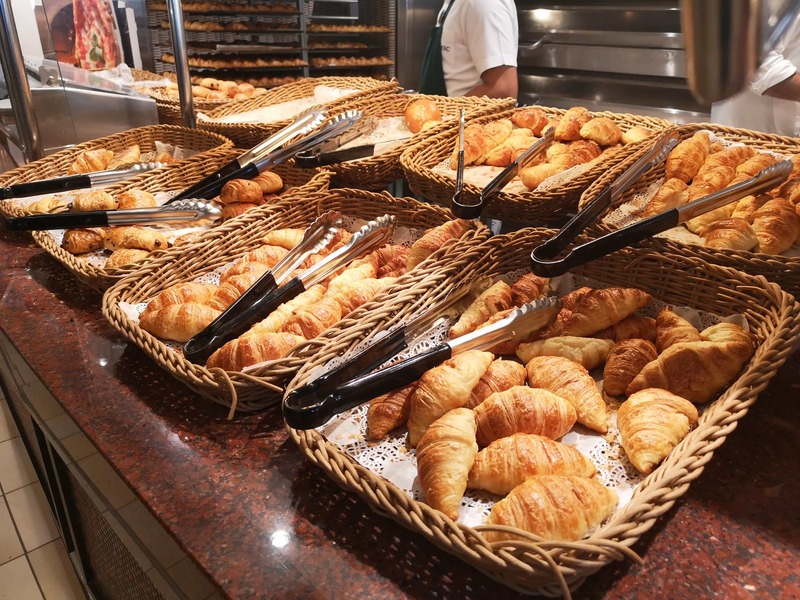 Based on the premise that when I go on a cruise I kind of expect there to always be free food available so that I can/could eat whenever I want … I think I would/will stray away from Costa cruises. Would you be able to get room service on Costa Cruises for free when the buffet is closed? I guess I have only ever been on American cruise lines and they offer free room service so it would be interesting to know if Costa offers that when the buffet is closed?